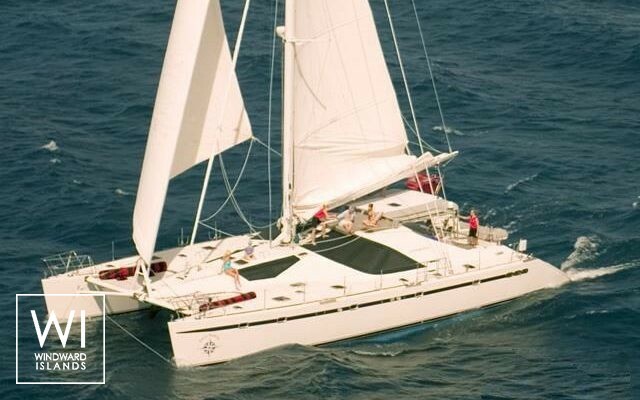 The Privilege 64 is a magnificent catamaran from Alliaura Marine equipped with 5 extremely spacious air conditioned cabins, providing for up to 10 guests on board. The interior space is enormous and very light, showing the polished birch wood finish and luxury leatherwork at their best. There is a large dining area with a circular saloon and bar, equipped with full audio-video capability too; the chef will present gourmet meals prepared in the kitchen. 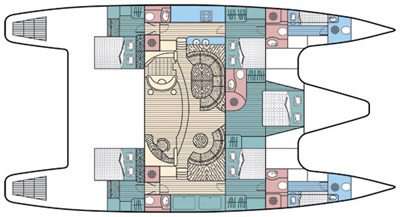 Each cabin is finished with polished birch panelling, has a queen-size double bed and well-appointed storage as well as en-suite bathroom. 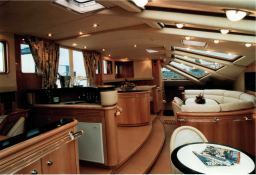 On the deck, the huge cockpit is protected from the sun, and has a large dining table for eating outside, a lounge area and direct access to the bridge and the aft sun area. This sun deck is the ideal platform from which to enjoy the water toys on board : snorkelling, kayaking and water-skiiing. 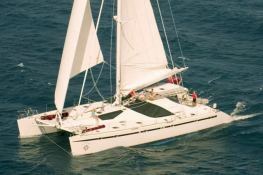 This crewed catamaran is available for yacht charter with a base price of 26 650 € (approximatly 30 055 $).